The main reason you may want to sync folders on a single machine is to backup your data. You would probably be best to find a backup utility to do this. If you want to sync folders over networked drives, this guide may help you also. There are more detailed articles at Inspect My Gadget on syncing documents between two networked computers. Find them here. On the very odd occasion you do want to sync folders on a single computer, it is not too hard to achieve. There are a number of applications available to help you do this, but many of them cost money. Windows has a solution by a command in the command prompt which will work on all Windows PC’s. 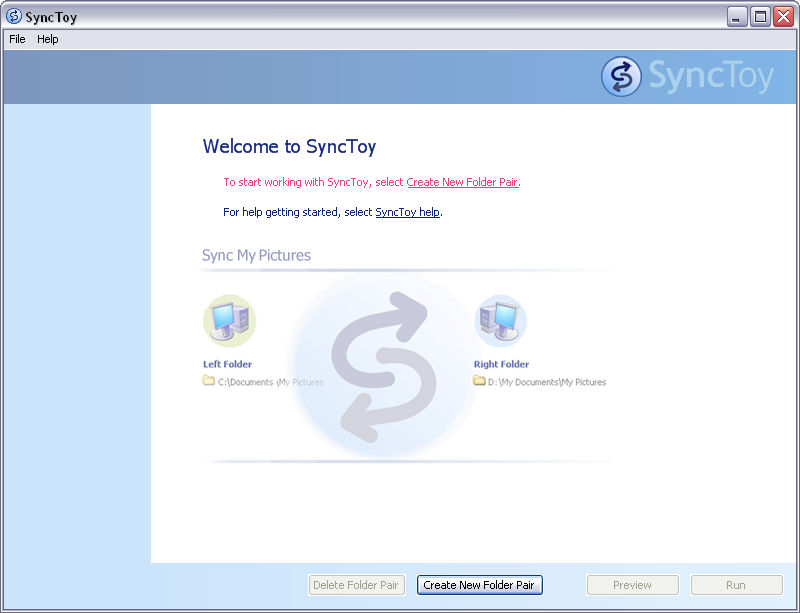 Microsoft also offers a program called SyncToy which does the same thing with a nice GUI interface. This is a two part article. In Part 1 we looked at using xcopy to sync your folders, and in Part 2 will look at how to use SyncToy. Part 2 will cover the following topics. How to schedule SyncToy to run a sync at a set time. SyncToy is a great solution for people who require to sync local or networked folders, as it is easy to use and it can be scheduled. With the methods in this article, the folders will only be the same after a sync which you have scheduled to run, or by running the sync manually. I am not aware of any applications which will recognise changes as they are made and force a sync at that time. It is very important before you play with this, that you backup your data as you may need to do a little tweaking to get it working right for you. 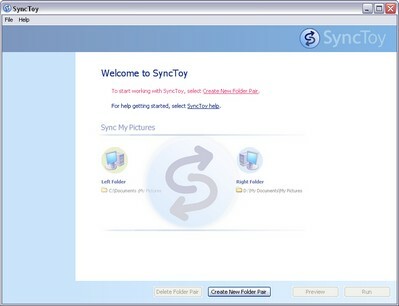 SyncToy is a free download from Microsoft.com and is one of their many Power Toys which help you get more out of Windows. Download it here. It is a quick and easy install. Just follow the prompts. When you run it for the first time, you should see the following screen. SyncToy is very easy to setup and use. It doesn’t really need much of an explanation, because once you open it, SyncToy will guide you through. We will run through it quickly. It is nice to think that we will backup our data regularly on our own accord, but if you are like the other 4 billion or so computer users in this world, you would find it best to schedule it so you don’t need to check up on it again. This is slightly different between XP and Vista, but the theory is the same so I will run through how to do this in XP. Vista calls their scheduler “Task Scheduler”, where as XP calls its scheduler “Scheduled Tasks”. Both can be found by clicking “Start” -> “Accessories” -> “System Tools”. Select how frequently you would like it to happen. If your computer is on all the time, 3am is ideal. If you don’t have your computer on much, make it happen as your computer starts. This is completely up to you. Enter your usernames password and confirm it. This will cause SyncToy to automatically sync as it is opened. Press “OK” and your done. You are still able to launch SyncToy manually if you require it to happen instantly, but otherwise, your folders will always be synced at the scheduled time. Please check out part one of this article which covers xcopy, so you can compare the two methods and figure out which you would prefer to use. I hadn’t played with xcopy much before writing this article, and I am thinking I may well end up using it over SyncToy. I feel like there is more control with it.